"'Man Who Dances' is a magnificent film that presents not only spectacular ballet, but insight into what motivates Edward Villella as a man who has decided that the incredibly hard work and physical risk demands of a dancer are well worth facing." "This film shows Edward Villella at a critical point in his career. His overloaded schedule -- rehearsals with Balanchine, lectures, dancing with Patricia McBride, etc. -- leads to a collapse during a performance. This documentary is a graphic example of the dedication that is required of a great dancer." "The camera captures both his performance and his almost debilitating and excruciating pain off-stage between dances." "The greatest dance film of the decade"
“Man Who Dances” enters the life of one of the greatest male dancers in history. A primary dancer in the New York City Ballet, Edward Villella’s on-stage collapse signals the human limits of this seemingly indefatigable artist. 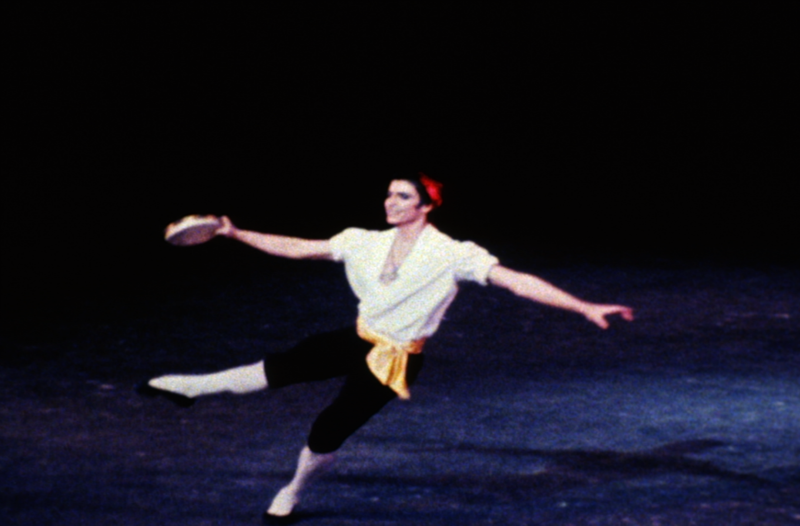 The film features breathtaking footage from Villella’s performances — both on and off the stage — and intimate interviews with the famed dancer as he deals with physical and mental exhaustion. The collapse in an afternoon performance poses a grave question for the dancer. Should he or should he not go on stage that evening and risk the possibility of career-ending injury? “Man Who Dances” is structured around this crisis of decision in a performer’s life.